LIBERAL, Kan. – The No. 5 Seward County volleyball team won their fifth straight match in a sweep, defeating Pratt for the second time in ten days, 3-0 (25-11, 25-15, 25-14). The win extended the Lady Saints win streak to 13, while also extending their Jayhawk West win streak to 22 matches. Before the match started, the Lady Saints honored Richelle Simmons as part of their Think Pink Night. Simmons, a breast cancer survivor, was the honorary opening server for the match. Following Simmons serve, the Lady Saints (27-1, 12-0) jumped out to a huge 6-1 lead in the first set before the Beavers called a time out. Luz Sierra, Briana Domino and Giovanna Tapigliani all played a role in gaining the early advantage. The Lady Saints extended their lead to eight, following up their 6-1 run with a 5-2 run. The lead slowly increased, until Viviane Viane put the Lady Saints up fourteen, giving Seward the set one win, 25-11. The second set began much closer, as the Beavers kept the lead to only two points through the first ten points of the set. The lead stayed at two until the Lady Saints went on a 5-1 run to extend the lead to six points at 14-8. The Beavers went on a 3-1 run to cut the lead to four, but an Erica Ferreira kill stop the run and started a 6-0 run for Seward. The Lady Saints pushed their lead to ten with a Giovanna Kuntze kill, winning set two 25-15. Pratt took their first lead of the match in the early goings of set three, taking a 2-3 lead following a Seward service error. The Lady Saints quickly responded with a 3-0 run to take back the lead. The two-point lead stuck until a Domino kill sparked an 11-2 run for the Lady Saints. The run put Seward up eleven points. The teams traded the remaining points until Esmadar Tavares ended the set and the match with a kill, giving the Lady Saints set three 25-14. The Lady Saints were efficient on the night, hitting .378, including Ferreira hitting a perfect 1.000 in her four attempts. Mariana Nascimento was the lone Lady Saint to hit double-digits, ending the night with ten kills. Tapigliani and Sierra both finished second on the team with eight kills. Kuntze and Tavares paced the match, combing for 28 of Seward’s 36 assists. Defensively, the Lady Saints came away with 26 digs, led by Nathiellen Machado’s ten. Seward ended the match with five blocks, with Sierra leading the Lady Saints with three. The Lady Saints will end their three-game home stand with a match against Barton at 6:30 p.m. on Wednesday (Oct. 18) in the Greenhouse. The Seward County volleyball team honored Richelle Simmons, a breast cancer survivor, during their Think Pink Night. 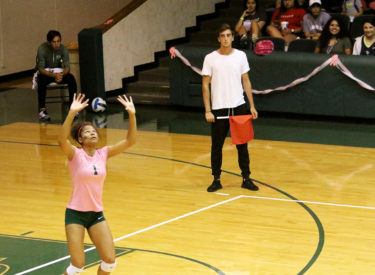 Simmons performed the opening serve for the Lady Saints match against Pratt.